The variety I tried was called Ham, Onions & Green Pepper Wrapped Omelets. They tasted great and it was fun to try an omelet that's wrapped in "thin crispy bread." The best flavor in this product is in the bread. It reminded me of very thin Indian naan bread that had been warmed over a flame. You actually taste a little bit of flame. I've never isolated the flavor of flame in a product review before, so that's pretty exciting. As for the other flavors... the egg tastes like egg and the ham and vegetables taste like ham and vegetables. I was impressed that the eggs actually get fluffy and the product expands as it's being cooked. When you prepare these according to the instructions on the box, they are not great. You're told to cut the end off the microwaveable sleeve each omelet is packaged in and to microwave on high for 1 minute and 45 seconds. After that cooking time, the middle is still cold. I tried microwaving in the sleeve for an extra 15 seconds, but that resulted in a soggy bottom. For the best results, I microwaved as directed for 1 minute and 45 seconds and then I removed the omelet from the sleeve and microwaved it sleeve-free for 20 more seconds. That made everything great. It was cooked through and it seemed to crisp up the bread a little more. Another important note... have scissors standing by. 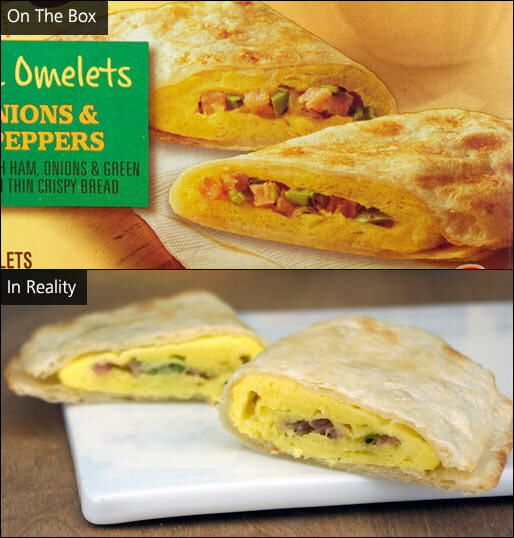 According to the box, the omelets are suppose to slide out of their packaging onto the plate. Each omelet I tried stuck to the packaging slightly so I needed to peel down the packaging to remove the omelets. Besides the tricky cooking time, the only other negative is that the middle of the omelets feel overly moist. They don't leech moisture like some similar frozen products, but it might put some people off. All in all, I liked these wrapped omelets. They taste terrific and it's nice to see a genuinely new approach to a breakfast product in the freezer section. Nutritional Considerations: Each single omelet serving has 350 calories, 23 grams of total fat (4 grams saturated and 0 trans), 200mg cholesterol, 490mg sodium, 23 grams total carbs, 1 gram dietary fiber, 2 grams sugar and 12 grams protein. 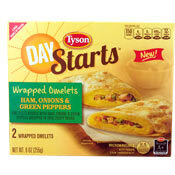 What do you think of Day Starts Wrapped Omelets? I found these recently at a discount/off brand grocery outlet for $1.99 a box. If I cook them for 3 minutes and then let sit another minute, they are crunchy all over and nice and hot inside. I have been eating 2 a day (@350 calories each & 12 grams protein, you can't go wrong) then finishing my day with fruits and veggies at less than 1000 calories a day. I will cry when I can't find them anymore. I love this and can't seem to find them anywhere the last couple months. What happened that no one seems to be stocking them now? I agree with Mr Breakfast on the cooking & HareLover for trying to find then. I purchased my 1st ones at Grocery Outlet but went back & they were all gone. Tyson website is useless for locating stores to purchase this item. I love these but have a hard time finding them in the store. I found these at the 99 Cents Only store in Sacramento. I tried two (plain egg & cheese). How can you beat it? Like the reviewer above says, it's vaguely like an Indian or Malaysian dish called "Frankie" (Indian flat bread baked on griddle with eggs). 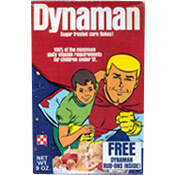 The ingredients taste high quality and (for a processed item) has straight forward ingredients. I chopped up a mushroom and green chili and inserted into the sleeve. When it was done, out slipped a full omelette with toppings! Horrible product. In addition to cooking as recommended, had to take out of sleeve and cook an additional 35 seconds. Egg was greasy and over all taste was horrible. Not to mention 40 percent of the tortilla was hard. I LOVE these. Mmmm... so addicting. The eggs taste great, and I cook mine at 2 minutes and let them sit in there for another 5 minutes to crisp up. Delicious! Thanks for posting this review. I found the product less than mediocre by following the instructions. I'm going to take your advice on the next one and hopefully it will be better; if not, it's been a waste of money. I found the product exactly as shown above. The instructions are vague and when following them - after cooking - I had to take the outside part in photo #2 to make it edible.